The largest city of Uttar Pradesh, Kanpur is home to thousands of two-wheelers, with the city roads chock-a-block with them. Riding a bike in the city can be a pain, with numerous incidents recorded each day. Two-wheelers are accountable for most of the accidents on the city roads, resulting in damage to the vehicle in most cases, with loss of life reported on certain occasions. A good two-wheeler insurance policy can help one overcome any financial liability associated with an accident, with the government making it mandatory for all vehicles to have a valid insurance policy. Note that the names mention in the list are not ranked in any specific order. They reflect only the popular options available. Kanpur has hundreds of local garages catering to the needs of road users. While it isn’t hard to find a garage/mechanic in the city, getting a damaged vehicle fixed can be a hassle, with lack of professionalism seen in most garages. Insurers have bypassed this, offering enhanced service to policyholders in the form of cashless garages. Individuals who wish to locate a network garage can do so easily, with a number of search options available. Get the information from the representatives of the insurer. This could be availed by calling them on their customer care number. Search the official website of the insurer to find a cashless garage in the vicinity. Check the information brochure/purchase document to see where network garages are located. Personally visit the branch of the insurer and request them to provide a list of all cashless garages in their network. Being in an accident can be traumatic. The process of getting a damaged vehicle fixed shouldn’t add to this trauma. Individuals who opt for cashless garages can enjoy these benefits/advantages. 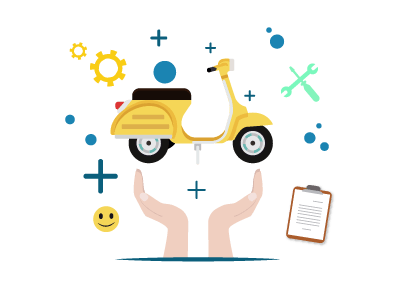 Expert technicians – Cashless garages typically hire expert mechanics/technicians to work on the bike. This ensures that complicated problems are handled with care. This can be an added bonus if the vehicle in question is rare. Quality service – The service provided by network garages is better than the service normal garages provide. This is primarily due to the tie-up they have with insurers. The spare parts used are original, ensuring that there is no future damage to the vehicle. Quick – Most network garages are known for their proficiency, with the service completed within a specified period of time. Affordable – An individual might not have to pay for repairs from his/her own pocket. The insurer directly settles the bill with the garage. Payments might be required only in cases where the cost of repair overshoots the sum assured. Add-ons – Network garages offer additional services which other garages might not offer. These include roadside assistance, towing, house calls, etc. Simple – There are no major hassles involved in the process of getting a vehicle fixed at a network garage. The paperwork is handled by the insurer, with the policyholder expected to inform the insurer before giving the vehicle for repair. Replacement bike – Certain network garages could offer a replacement vehicle until they fix the insured bike. The Indian insurance sector has grown tremendously over the last few years, with a number of innovative products on offer. There is a possibility for one to get confused given the options. Keeping these simple points in mind before buying a policy can help one get the most out of it. Cost/Premium – Cost can be a major deterrent when it comes to buying a bike insurance. One might think it is not practical to pay a sizeable amount to insure a two-wheeler. However, one can get a good rate by comparing the premiums online. Additionally, it is possible to get discounts when one does not make a claim the previous year. The quality of the bike, the engine capacity, age of vehicle, etc. are taken into account while computing the premium. Cover – Check the inclusions and exclusions of the policy before buying it. A policy could be useless if an accident/incident results in damage which is not covered by the insurer. Policy type - A comprehensive policy is a better option given the conditions in our country. While this is optional, a limited liability cover is a must for all vehicles. One should choose accordingly, based on their expectations and resources. Claims process – Insurers could have different internal processes when it comes to claims. Select an insurer who has a simple and efficient process, with a high claim settlement ratio. Failing to do so could result in delayed responses, rejection of the claim, etc. The market for used two-wheelers has grown tremendously over the years, with a number of such vehicles for sale across the country. Individuals who purchase a bike which is registered in a different state should not forget to transfer the insurance policy in their name. Failure to do this could result in the insurer denying a claim in case of an accident. Contrary to popular belief, transferring the ownership of the bike insurance is simple and quick, provided one follows these steps. The buyer will have to submit the registration certificate of the bike. This should be in his/her name. The new owner will have to submit a new proposal form. The seller of the bike should submit a letter stating the need to transfer ownership of the policy to the buyer. The insurer might send a representative to examine the vehicle. Once all documents are verified the policy will be transferred. A nominal amount might be charged by the insurer for the same.